One of Connecting Country’s main activities is to monitor biodiversity across the Mount Alexander region. From 2009 to 2011, clusters of three nest boxes were installed at approximately 150 locations as a tool to monitor the distribution and health of the Brush-tailed Phascogale (also commonly known as the Tuan). These specially designed nest boxes were installed in both public and private land, and within large and small patches of native woodland and forest habitat. 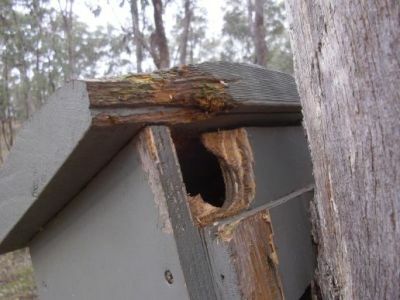 The nest box entrance has been chewed to widen it – possibly by a parrot or possum. In April and May of 2011, 2012 and 2014 with landholders’ permission, Connecting Country staff undertook monitoring of a large sample of these boxes. April and May is the time of year that has the least disturbance upon the Tuan. In late 2014, a short report of the overall findings, and the specific results for their properties, was sent to the landholders involved. A copy of this report is available (click here). In summary from the 2014 surveys, about 30% of sites have Tuans present (which is the same as for 2012) and about 85% of sites have Sugar Gliders present (up from 75% in 2012). We think this is a pretty good result, and indicates a relatively healthy and stable population of both species. We undertake a comprehensive survey of boxes every second year – so 2016 will be another big one. In the intervening years (including 2015), we encourage landholders to observe their boxes on dusk during April and May, and to let us know which animals come out of them, if any. An instructional guide which describes how to passively monitor nest boxes was produced by Connecting Country in 2013 (click here) – and a recording sheet can also be downloaded (click here). If time allows, we hope to visit a small number of boxes during autumn 2015, particularly those that have not been checked in previous years. A local landholder in the Yandoit area has a remote surveillance camera set up to watch his nest boxes. The short videos he has recorded provide interesting (and often amusing) insights. (NB: We have found that these videos work on most, but not all, computers. Apologies in advance if they don’t all work on your computer!). Many thanks for these great videos. Watch this website over the coming weeks for more information about the Tuan. And if you do see a Tuan anywhere across the region, please send us the details to add to our database (info@connectingcountry.org.au). (If we checked the boxes on your property last year, and you haven’t yet received your individual results – I apologise. We are missing some contact details for landholders. Please let us know, and we’ll send your update through straight away). Feral bees are the worst problem in nest boxes out of all the introduced pests. I have 2 suggestions. One that definitely works. Bees swarm from October through Springtime. When Shelltox pest strips were available, I used to cut a square about 30mmx30mm and attach it with a screw under the lid of the box late September. This worked a treat. No bees. I found this site where pest strips are available. Some are worried about the chemical, Dichlorvos. I spoke to the scientist at the manufacturers and he told me that insects have a completely different breathing mechanism to birds and mammals and it won’t harm them. He told me if you drank a glass full of Dichlorvos, you’d probably survive and recover fully. It is not a residual chemical and would leave your system, but such a large dose might kill you. When I used it all the gliders, tuans etc. showed no sign of an adverse effect. Female Tuan reared her young no worries. A small amount has no detrimental effect, in fact it would be beneficial. It would kill parasites on the animals. It’s not a residual poison. I found this site where you should be able to purchase pest strips Check it out. http://www.barmac.com.au/index.htm Pest stips are also availabe fromAmazon. Click here http://www.amazon.com/s/ref=nb_sb_noss_1?url=search-alias%3Daps&field-keywords=pest+strips Only other method I heard woks, but haven’t tried it is to char around the entrance hole. Bees do not like fire. Beekeepers use smoke to subdue them. Fantastic survey results. Interesting to see you found carpet under the nestbox lids to not be a good bee deterrent. I have put it in our nestboxes. I have also tried using Lanolin spray which was is also suggested to prevent bees. I hope the sugar gliders are not doing the amount of damage that they are doing to swift parrots in Tasmania. I love the footage with the baby phascogale on the back of the mum, and the game of chase between the phascogale and glider. The game of chase is very interesting, as it is the Tuan chasing the Glider. This is the opposite to what I would have expected. Normally the glider is the aggressor. However, the landholder suggested to me that the Tuan may have been defending young within the nest – and was therefore more aggressive towards the glider than it would usually be. This sounds quite a likely explanation to me. And it is quite extraordinary that the Tuan mother manages to get back into the box through the tiny opening with the young one on her back. They must have very malleable bodies, and the youngster with a tight grip on mum!